Dry Skin is one of the most common skin problems, experienced by many people. 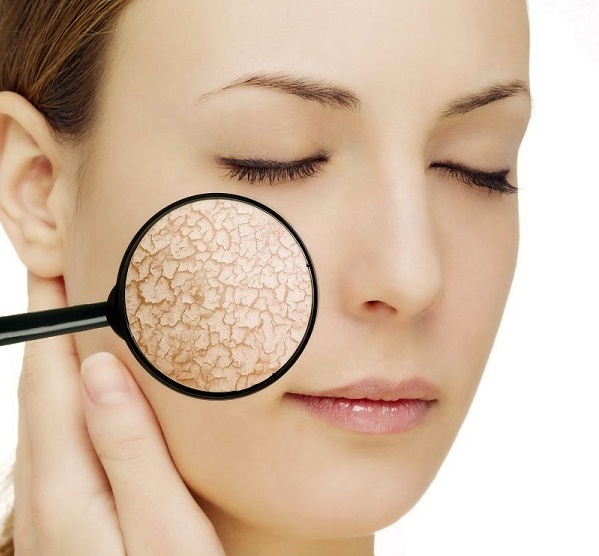 Although anyone can suffer from excessive dry skin but some people are more prone to it, as compared to others. Problem of dryness is more common in those people who live in cold or dry climates and bath many times a day. Let's have a look on some common signs and symptoms of dry skin. (i) People with habit of bathing or taking a shower several times a day with hot water, are more prone to suffer from dry skin problems because hot water may steal away the skin moisture. (ii) Over exposure to sun light can cause severe damage and may also cause dry skin. (iii) Weather is one of the most common factors leading to dry skin. It is the fact that the skin becomes dry during the winters. (iv) People living in very hot climates are also at a risk for skin dryness, if the levels of humidity are low. (v) Some harsh chemicals present in antibacterial soaps and deodorants also remove also remove moisture from your skin and leave behind a rough and dry skin. (vi) Some shampoos may also cause your scalp and skin to dry out. (vii) Some Health conditions including Thyroid Problems like hypothyroidism causes a reduction in the activity of your sweat glands and oil glands, which in turn can lead to dry and rough skin. (ix) Deficiency of some minerals and vitamins also result in rough and dry skin. (x) Deficiency of Vitamin A,C and E results in rough, dry, scaly and wrinkled skin. Dry skin is more vulnerable to premature fine line and wrinkles. So if you are suffering from dry and itchy skin then you can try some natural home remedies to treat dry skin and get back your soft, supple and smooth skin. Prepare a fine mixture by adding 1 egg yolk, 1 teaspoon of orange juice,1 teaspoon of olive oil, few drops of rose water and some drops of lime juice. Mix them well then apply this prepared mixture on the face in the morning 15 minutes before taking bath. This is very useful home remedy for dry skin. Mash half an avocado and mix it with a few drops of fresh lime juice and apply this paste over the cleansed skin. After 15 to 20 minutes wash the skin with slightly warm water. This is also effective home remedy for dry skin. Mix 1/2 teaspoon honey with the yolk of an egg and one tablespoon dried out milk powder. Mix into a paste and apply on your dry skin. Let it stay for 15 to 20 minutes then remove with water. For best results, repeat this 2-3 times per week. A mask made from Banana, Honey and Yogurt is also very effective for nourishment and moisturising of dry skin. For this mask you will need two bananas, one tablespoon of honey and half a cup of yogurt. Put all ingredients in a blender and mix until becomes homogeneous. Apply the mixture on the skin and wait for 20 minutes, until it dries. Remove it with lukewarm water. Mix two tablespoons of honey with two teaspoons of milk. Apply the sticky mixture to your face, and leave on for ten to fifteen minutes. Then rinse off with lukewarm water. This home remedy is also very beneficial in getting rid of dry skin. Apply the juice from cucumbers on your face with a cotton swab for 20 minutes. Cucumber juice is great for moisturizing and softening the skin. If the skin is too dry, add one tablespoon of almond oil in 2 tablespoons of cucumber juice, shake well then apply on skin and gently massage. Leave it on for about 45 minutes then wash with plain water. Mash one strawberry and mix with 1 teaspoon of sour cream and apply the mixture on your face and neck. Let it stay at least for 30 minutes and then wash off with fresh water. Another effective mask can be made from the juice squeezed from one lemon mixed with egg yolk and also add a teaspoon of honey. Apply this mixture on your skin for 15 minutes then rinse off with fresh water. Try to add some nutrients in your diet which are essential for moisturising and nourishment of your skin.Try to include Omega-3 Fatty Acids, Sulfur and zinc. Omega-3 Fatty Acids found in foods like nuts, avocado, tuna fish, salmon and flax seed. Rich sources of Sulfur are eggs, onions and garlic. Foods rich in zinc include beans, beef, crabs and oysters. A healthy intake of Vitamin A regulates moisture manufacturing in the skin to prevent dryness. It also balances sebum production in the scalp to prevent dandruff and brittle hair growth. Rich sources of Vitamin A Include dark green and yellow vegetables and yellow fruits, such as broccoli spinach, turnip greens, carrots, squash, sweet potatoes, pumpkin, cantaloupe, and apricots, and in animal sources such as liver, milk, butter, cheese, and whole eggs. Vitamin B7 or Biotin is also important for nourishment of skin.Lack of Biotin results in dryness of skin and scalp.Rich Sources of Biotin are Egg yolks, fish, milk, liver and kidney, unpolished rice, oats, soybeans, nuts, brewer’s yeast, potatoes, bananas, broccoli, spinach and cauliflower. Vitamin C encourages the skin to absorb moisturizers that have been applied on to the body.It also fights against damage from the sun and environmental pollutants that harm the skin. Vitamin C can be found in kiwis, papaya and citrus fruits, such as oranges, lemons and grapefruit. (i)Avoid Alcohol, caffeine and caffeinated products including coffee, tea, chocolate and soft drinks. (ii)Limit the amount of time you spend while bathing and reduce the temperature of your bath water, as these factors remove the natural oil from your skin. (iii)Avoid rubbing your skin vigorously after a shower, as it damages your skin and causes it to dry up. Instead, after a shower gently pat dry your skin with soft towel. (iv)After bath try to apply a good moisturizer on your skin. (v)Avoid Certain fabrics like wool and polyester because they can irritate your skin, leading to dryness, itching, and so on. (vi)Try to use fabrics like cotton and silk because they allow your skin to breathe and therefore are good for the health of your skin.